Visitors of Aspire Zone Foundation and a number of social media influencers expressed their delight with the Foundation’s exceptional celebrations of Qatar National Day in Aspire Park, and the atmosphere of joy and national pride which presided over the precinct. The celebrations included unique laser shows, lighting shows, and a number of cultural displays that were broadcast on the Park’s giant screens. 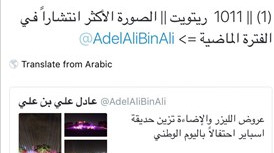 The related image is a screenshot showing how viral the Aspire Zone National Day celebrations went on social media.